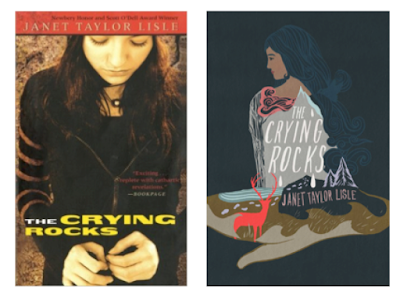 Debbie--have you seen THE CRYING ROCKS by Janet Taylor Lisle? A colleague wrote to ask if I've seen anything about Janet Taylor Lisle's The Crying Rocks. It is due out in May of 2017 from Simon and Schuster. From Newbery Honor author Janet Taylor Lisle comes a lyrical story about one girl’s discovery of her startling past—and her search to understand her complicated present. Joelle’s height and dark skin set her apart from everyone in Marshfield. It’s no secret that she’s adopted, but where is she from? Aunt Mary Louise says she came from Chicago on a freight train, but the story doesn’t sit right with Joelle. There’s something more. She feels it. Carlos, the quiet boy in Joelle’s Spanish class, sees it. When he tells her that she looks like a girl in the town library’s old mural of Narragansett Indians, Joelle can’t help sneaking a look. She’s surprised by a flicker of recognition. And when Carlos tells her about the Crying Rocks, where the ghosts of Narragansett children are said to cry for their lost mothers, Joelle knows she must visit them. When they finally set out through the forest, neither she nor Carlos anticipates the power of the ancient place, or the revelations to be found there—about the pasts they’ve both buried, and the discovery of a rare kind of courage that runs deep in Joelle’s family. “What was that?” Carlos asks. She shakes her head. "No. Nothing." Carlos listens again. “Somewhere over there is a mass of glacial boulders called the Crying Rocks.” His face, in shadow, has taken on a stern, gaunt look. For the first time, Joelle sees, or imagines she sees, a vague outline of his Indian ancestry—something about his nose and the slope of his forehead. He is gazing intently into the forest. “The story is that when you pass by these rocks at certain times, you hear children crying,” he says. Around them, tree shadows flick and twist. “It's getting so dark,” Joelle murmurs. In that moment an eerie feeling descends on them both. “Let's get out of here,” Carlos whispers. Why is it being republished? Did it get revised? Or is it being reissued with a new cover, with expectations that in this moment of diverse books, it'll do well? It isn't an #OwnVoices story... and what I read of that excerpt... well, let's say I'm not optimistic. If I hadn't done this background research, I might have bought the book when I don't need to... my library likely has a copy. If I read it, I'll be back. Update (same day) -- a quick note: Some of the book is available online. I read that Carlos is "about one sixteenth or something" Sioux from "out West" (p. 15). before the war between North and South. I've ordered a copy. Hopefully I'll be back with a "recommended" tag. 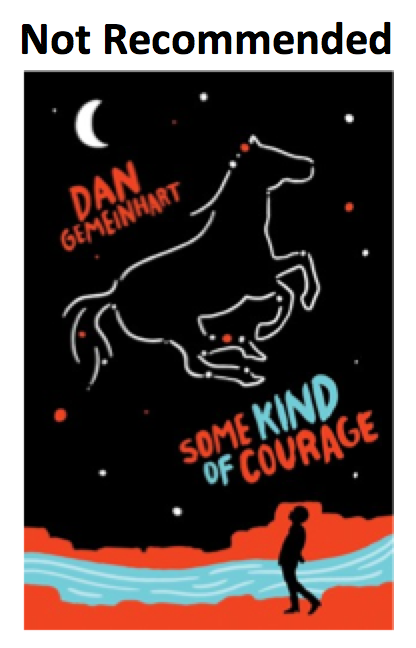 Way back in January or February, a reader wrote to ask me about Dan Gemeinhart's Some Kind of Courage. I put it into my "Debbie--have you seen" series and am glad to be able to return to it, today, with this review. See? "Half-wild Indian pony." The story begins in 1890 in a place called Old Mission, Washington. As the synopsis and summary tell us, Some Kind of Courage is about a boy who is going to try to get his horse back. She’s half Indian pony, so she’s got some spirit, but she ain’t nothing but perfect with me. Later, we'll read of her being a "half wild Indian pony" (Kindle 2043). Indian ponies appear in Westerns all the time. I've never figured out why they're "ponies" rather than "horses" -- and while I understand they had more endurance than other horses, I'm not sure why--in Some Kind of Courage--an Indian pony would have more spirit or be called "wild." That's a small point, though, so I won't go on about it. Chinaman. I heard the word in my mind, then my mama’s voice. I’d said it once, the year before, after we’d passed a group of Chinese on the road to Yakima. I’d been confused. Everyone called them Chinamen. I didn’t know there was another word for ’em. “It ain’t a curse word, Mama,” I’d argued. It was Indians. Two of ’em. A boy, older and taller than me, his bare arms taut with muscles. And a girl, five or six years old, with her arms around him and a terrified look on her face. The boy’s eyes narrowed. He bared his teeth like a wolf and snarled a word low and mean in his native tongue. A shaft of sunlight through the treetops gleamed on the long knife blade held in his hand as he ducked into a crouch and lunged toward me. As we move into chapter seven, we read "the Indian" a bunch of times. When Joseph and the boy scuffle, Joseph thinks that he's in the grip of "an actual, real-life Indian" and he worries that he's going to get scalped. Is it realistic for him to think that way? Sure. Just like it was realistic for him to think "Chinaman" when he saw Chinese people. I wonder why his mother did not pass along any teachings about how to view Native people? Does it seem to you that she couldn't, because it wasn't plausible for her to think that way about Native people, but, that it is plausible she'd think that way about Chinese people? I don't know. That's a research question, for sure! That Indian boy has a broken ankle. With Joseph and Ah-nee's help, the boy gets back to his family. They are, of course, grateful to Joseph. I like that, as Joseph looks at their camp, he sees kids chasing each other and playing. So often, Native children are absent from stories like this one! That little bit, there, is a big plus! Their faces were deadly serious as they stood before us, looking like they were carved out of dark stone. The Indian boy, it turns out, is the son of a chief! His name? "Chief George." We get "chief" and "scalp" and "the Indian" (lots of times) and stoicism... and no tribe--much less--a tribal nation. People like Gemeinhart's story. It was part of the discussions at Heavy Medal (School Library Journal's blog where people engage in mock-Newbery discussions ahead of the actual announcements of who wins that prestigious award). I think it falls heavily into stereotypical depictions of Native people. Because people like it, it will be bought and read and assigned, too, to children in school. People may defend it because of the way that Gemeinhart deals with "Chinaman." For me, that defense will signal another time in which Native concerns are set aside in favor of what an author has done to elevate someone else. When will that sort of thing end, I wonder? In short: I do not recommend Dan Gemeinhart's Some Kind of Courage. Published in 2016 by Scholastic, it'll likely do quite well, which is too bad for everyone who will have stereotypical ideas of Native peoples affirmed by Gemeinhart's writing. And of course, completely unacceptable for Native kids who are asked to read it.